The premiere podcast of The Simple Sophisticate is now available for listening via iTunes! 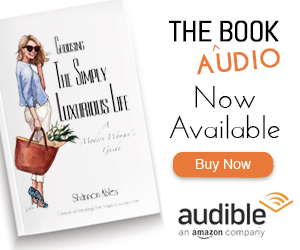 I am so excited to begin this new venture and look forward to each Monday sharing with readers and listeners ways to continue to cultivate their own simply luxurious life. Topics will dive deeper into how to live your best life. Every Monday, listeners are able to tune in to iTunes, Stitcher Radio or stop by the blog to catch the weekly podcast. TSLL is beginning a new chapter and debuting its first podcast The Simple Sophisticate. What is a Simple Sophisticate you may be wondering? TSLL blog continues to reach readers around the world, and now, whether you are driving, exercising, working in the yard or traveling, you can listen each week to an idea-packed episode that will offer inspiration and motivation to help keep you striving for the life of your dreams all the while keeping you well-informed and clothed in your signature style. Why Not . . . Have a Plan? Why Not . . . Have Self-Compassion?